Every morning I start my day off with a green smoothie. Some of you may be thinking, gross I don’t want to drink something green! However, despite the color, they taste great, and they provide your body with many health benefits! These health benefits help you to stay healthy and happy to boost your sailing performance and daily life. 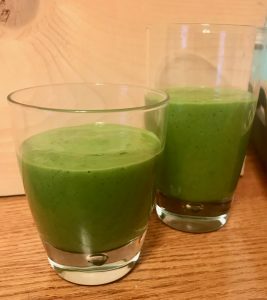 Green smoothies are fun and easy to make, and its a breakfast or snack you can take on the go. What are we waiting for, let’s learn all about the health benefits and how to make your green smoothie today! Fruit and vegetable intake is something that most people struggle to meet every day. Peoples diets are especially lacking vegetable intake. We need to make sure we are meeting these requirements to get all the essential nutrients we need so we can perform our best out on the water. By adding a green smoothie to your diet, you can help to increase your intake of fruits and vegetables helping to provide you with your daily requirements. By adding a green smoothie to your diet, you can help to check off one or more servings of your veggie intake for the day! If we want to perform our best out on the water we need energy! A green smoothie in the morning or midday can provide you with the energy boost you need. They provide your body with vitamins, minerals, antioxidants, and other nutrients your body needs. Smoothies are made with natural and whole foods, and they combine fruit and vegetables this helps to balance sugar content which in turn provides your body with long-lasting energy. Depending on what you decide to put into your smoothie the vitamins, mineral, and antioxidants provided will vary. However, most green smoothies are an excellent source of various nutrients. By blending fruits and vegetables together it helps to improve the digestibility of the foods, making it easier for your body to absorb all the nutrients these foods have to offer. When we absorb more nutrients, we help to enhance our overall performance in sailing and daily life. If we want to compete at the top level we need to be healthy! No sick days for sailors! By increasing your fruit and vegetable consumption, you are helping your body to stay in optimal health. The vitamins, minerals, and antioxidants help to protect your body against disease. You can also add in specific ingredients that are immune-boosting, for example, citrus fruits and ginger. If you are traveling this can be a great way to keep your body healthy and ready to compete! As we already mentioned green smoothies are easy to digest. 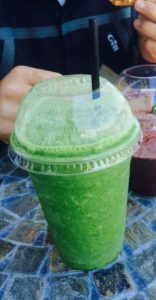 Since the food is blended your body doesn’t have to work as hard to digest, and unlike juices, smoothies contain whole foods, so they provide your body with fiber. This makes smoothies an excellent option for people on the go looking for something light but filling. Having a smoothie before an early morning training session can help to give your body fuel without weighing you down. 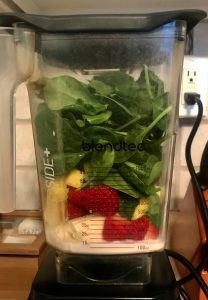 Now that you heard about all the benefits of the green smoothie what are you waiting for, let’s get smoothie making! There are a ton of different green smoothies recipes out there to try. I like to keep my recipes simple and easy to make. 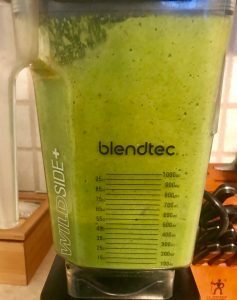 Check out below my recipe for the Good Start Green Smoothie. Hope you enjoy!